"The response is very gratifying. On behalf of all VW contributors, I thank everyone who voted for Video Watchdog as their favorite magazine of 2002! Long live Rondo!" "Wow! 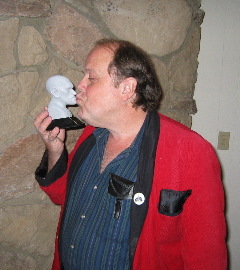 I'm shocked and very thrilled about the Rondo Award. Just to be included with all of the other great folks in all of the categories is such an honor. "I can't wait to pass this on to our wonderful Halloween crew as they're the folks that made the THING show happen. This honor really belongs to them." -- Bob Burns, producer of THE THING, a live Halloween show constructed outside his home, named Best Fan Event of 2002. "The Rondo Hatton Award for Best Comeback? Much appreciated, but I don't intend to make another comeback for the next 1/4 century. The next Rondo I'm nominated for (good willing) will have to be for Uncle of the Century." "As to the artifact itself, what can I say about such excellent work? Mr. Gammill's sculpture is artful and unerring in its recreation of this classic image. "Surely an enterprise begun so boldly will continue to grow in stature through the coming years, fulfilling your fondest wishes for it. Keep up the good work, and thanks again for all your kindness and consideration." -- Preston Neal Jones, author of HEAVEN AND HELL TO PLAY WITH: The Making of Night of the Hunter, winner, 2002 Book of the Year. "This award means a lot to me because London After Midnight was meant to bring that lost film's story back from the dead, so that horror fans could see a sample of what London After Midnight was all about. "This project was never meant to be the last word on this lost film. It was more meant to please fans and to be a 'wanted dead or alive' poster to be presented around the world in hope that it may (help) discover a lost print. I want to thank the members of this board who voted very much for this honor. "Rondo now sits under my awards for Greed and Touch of Evil from the L.A., National and NYC critics. I hope he has no plans to do them in." -- Rick Schmidlin, producer of the photo-reconstruction of London After Midnight, voted Best Restoration of 2002. "My thanks to all those who voted. I'm very grateful for the support and proud of the award. My thanks to the many contributors of articles, letters, photos, art, info, etc., who help make Monster Kid such a rewarding hobby for me and an enjoyable spot on the web for fans of classic horror movies." -- Kerry Gammill, creator of Monster Kid Online Magazine, voted Best Horror Website of 2002. "Thanks to everyone who voted. I'm backed-up by one of the biggest and best teams a genre writer ever had -- hundreds of candid, cooperative interviewees, great, helpful, stretch-the-rules people in libraries and archives in N.Y. and California, and lots and lots of terrific, bend-over-backwards friends. My little cottage of a 'cottage industry' would have long-ago been condemned, bulldozed and blacktopped over without 'em!"